Okay, okay… So how on earth can I ever be compared to such an amazing hockey player? I must admit, it’s quite the compliment seeing as I never set foot on competitive ice with a hockey stick in hand. I’m working for IBM Canada K-12 Education as a contractor. My efforts are focused on leadership coaching and transforming practise based on ITIL standards and good management processes. With luck, an Ontario School Board placed a request at the exact same time as I became available. Lo and behold, I’m getting to know Southern Ontario very, very well. A year and a half ago I was fortunate to work with an amazing leader – Mr. Mark Liguori. What I learned from Mark transformed my practise and strengthened my skills on many levels. What he provided was the leash (or lack thereof) to let me make the changes that were necessary to change cultures. There’s a lot to that story… and I’ll share it in a future post. What I appreciate most about Mark is his innate understanding of capacity . I’m a past member of the Alberta Technology Leaders in Education professional organization. In my circle of friends folks like Todd Kennedy, Michael Barr, and Ken Robitaille have shaped and supported my work. I gleaned and collected and employed their shared knowledge and strengths and further honed that with my experience in working with divisions across Alberta and now across Canada. 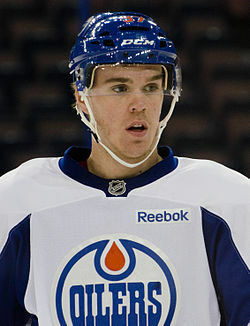 When a member of the team I’m working with right now suggested that I was the Connor McDavid of Technology Leadership, I had to grin a little bit… and at the same time share that compliment with all of the people that have contributed to what I’ve become. I’d be remiss if I left out Dr. Charmaine Brooks, Mrs. Denise Rose, Dr. Del Litke, Mrs. Janet Ramsey-Brown and Ms. Stacey Swanson. It’s with humility that I listened to those words – and already I know the difference I can make in a willing organization. So, at the end of it all, I’m no Connor McDavid – but I know how Connor became what he is… or at least I think I do. He had some natural talent… but most of what he became was due to a lot of hard work and dedicated practise. He watched and learned from others and he was provided some excellent coaching. And the other thing that Connor does so well is leverage the strengths of the team that surrounds him. Stevie Y., you’ll always be my favorite hockey player – and Connor, you’re awesome, but I laughed when Bill suggested you as a comparison… I said, what? Not Steve Yzerman?! Take care of yourself first… that’s the only way you can be the best you can be for everyone else.